September’s resolution further constrains North Korea’s ability to engage in regular international trade by barring the export of textiles. 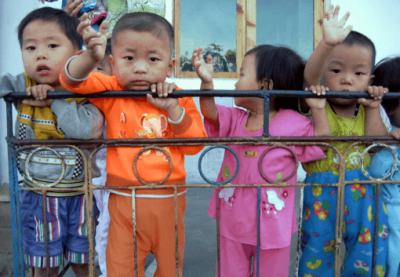 It is estimated that together, the sanctions eliminate 90 percent of the DPRK’s export earnings. Foreign exchange is essential for the smooth operation of any modern economy, and U.S. officials hope that by blocking North Korea’s ability to earn sufficient foreign exchange, the resolutions will deal a crippling blow to the economy. For North Korea’s estimated 100,000 to 200,000 textile workers the impact will be immediate, plunging most of them into unemployment. With around eighty percent of its land comprising mountainous terrain, North Korea has a limited amount of arable land, and the nation typically fills its food gap through imports. Sharply reduced rainfall during the April-June planting season this year reduced the amount of water available for irrigation and hampered sowing activities. Satellite monitoring indicates that crop yields are likely to fall well below the norm. To make up for the shortfall, the DPRK has significantly boosted imports. How much longer it can continue to do so remains to be seen, in the face of dwindling reserves of foreign exchange. In effect, by blocking North Korea’s ability to engage in international trade, the United States has succeeded in weaponizing food by denying North Korea the means of providing an adequate supply to its people. A cap is imposed on the amount of oil North Korea is allowed to import, amounting to about a thirty percent reduction from current levels, along with a total ban on the import of natural gas and condensates. Many factories and manufacturing plants could be forced to close down when they can no longer operate machinery. For the average person, hardship lies ahead as winter approaches, when many homes and offices will no longer be able to be heated. Since all international financial transactions process through the U.S. banking system, this threat is tantamount to shutting down Beijing’s ability to conduct trade with any nation. It was a rather extravagant threat, and undoubtedly a difficult one to pull off, but one which the Trump administration is just reckless enough to consider undertaking. There is nothing illegal or forbidden in a nation trading with North Korea in non-prohibited commodities. Yet, a total trade blockade is what Washington is after. U.S. officials are preparing sanctions against foreign banks and companies that do business with North Korea. In essence, Washington is running an international protection racket: give us what we demand, or we will hurt you. This is gangsterism as foreign policy. The demands never cease, no matter how much China gives way. U.S. Secretary of State Rex Tillerson recently insisted that China impose a total oil embargo on North Korea. China refused to go along, but it can expect be subjected to mounting pressure from the U.S. in the weeks ahead. Many African nations have warm relations with the DPRK, dating back to the period of the continent’s liberation struggles. U.S. officials are focusing particular attention on Africa, and several nations are currently under investigation by the United Nations for their trade with North Korea. The demand to cut relations with North Korea is not an easy sell for Washington, as Africans remember the U.S. for having backed apartheid regimes, while the DPRK had supported African liberation. The demand for North Korea to give the United States everything it wants upfront, without receiving anything in return, as a precondition for talks is such an obvious nonstarter that it has to be regarded as a recipe for avoiding diplomacy. North Korea contacted the Obama administration on several occasions and requested talks, only to be rebuffed each time and told it needed to denuclearize. This sad disconnect continues under Trump. In May, the DPRK informed the United States that it would stop nuclear testing and missile launches if the U.S. would drop its hostile policy and sanctions, as well as sign a peace treaty ending the Korean War. The U.S. may not have cared for the conditions, but it could have suggested adjustments, had it been so inclined. Certainly, it was an opening that could have led to dialogue. The months ahead look bleak. Unless China and Russia can find a way to oppose U.S. designs without becoming targets themselves, the North Korean people will stand alone and bear the burden of Trump’s malice. It says something for their character that they refuse to be cowed. SC/12945, “Security Council Toughens Sanctions Against Democratic People’s Republic of Korea, Unanimously Adopting Resolution 2371 (2017), United Nations Security Council, August 5, 2017. “UN Security Council Toughens Sanctions on North Korea,” Radio Free Europe, September 12, 2017. Sue-Lin Wong, Richa Naidu, “U.N. Ban on North Korean Textiles Will Disrupt Industry and Ordinary Lives, Experts Say,” Reuters, September 12, 2017. “Prolonged Dry Weather Threatens the 2017 Main Season Food Crop Production,” Food and Agriculture Organization of the United Nations, July 20, 2017. “North Korean Food Imports Climb in June: KITA,” NK News, August 18, 2017. “Fact Sheet: Resolution 2375 (2017) Strengthening Sanctions on North Korea,” United States Mission to the United Nations, September 11, 2017. SC/12983, “Security Council Imposes Fresh Sanctions on Democratic People’s Republic of Korea, Including Bans on Natural Gas Sales, Worth Authorizations for its Nationals,” United Nations Security Council, September 11, 2017. Opening Statement of the Honorable Ed Royce (R-CA), “Sanctions, Diplomacy, and Information: Pressuring North Korea,” House Foreign Affairs Committee Hearing, September 12, 2017. “Testimony of Assistant Secretary Marshall S. Billingslea,” House Foreign Affairs Committee Hearing, September 12, 2017. “Treasury Sanctions Suppliers of North Korea’s Nuclear Weapons Proliferation Programs,” U.S. Department of Treasury, June 1, 2017. “Statement of Susan Thornton, Acting Secretary of State,” House Foreign Affairs Committee Hearing, September 12, 2017. Ian Talley, “U.S. Threatens China Over North Korea Sanctions,” Wall Street Journal, September 12, 2017. “Clear and Present Blackmail: US Coaxes China to Back Anti-N Korea UN Resolution,” Sputnik News, September 12, 2017. Yi Yong-in, “US Pledges to Sanction Ten More Chinese Entities if China Doesn’t Cooperate in NK UNSC Resolution,” Hankyoreh, July 22, 2017. Matthew Pennington, “US Blacklists China Bank, Revving Up Pressure Over NKorea,” Associated Press, June 30, 2017. Joel Schectman and David Brunnstrom, “U.S. targets Chinese Bank, Company, Two Individuals Over North Korea,” Reuters, June 20, 2017. “China’s Biggest Banks Ban New North Korean Accounts,” Financial Times, September 12, 2017. Stephen McDonell, “China Banks Fear US North Korea Sanctions,” BBC News, September 12, 2017. Nick Wadhams, “China Rebuffs U.S. Demand to Cut Off Oil Exports to North Korea,” September 15, 2017. Indrani Bagchi, “Scale Back Engagement with North Korea, US Tells India,” The Times of India, July 30, 2017. “Philippines Suspends Trade with N. Korea,” Yonhap, September 9, 2017. “North Korea-U.S. Te4nsions Are Not Mexico’s Business: Diplomat,” Reuters, September 8, 2017. “Peru Says Expelling North Korean Ambassador Over Nuclear Program,” Reuters, September 11, 2017. “Kuwait Decides to Reduce N.K. Diplomatic Staff, Stops Issuing Visas for N. Koreans,” Yonhap, September 16, 2017. Kevin J. Kelley, “UN Probes Tanzania and Uganda Deals with North Korea,” East African, September 13, 2017. Kevin Sieff, “North Korea’s Surprising, Lucrative Relationship with Africa,” Washington Post, July 10, 2017. George Hendricks, “North Korean Contracts Terminated,” The Namibian, September 15, 2017. Heather Nauert, “Department Press Briefing,” U.S. Department of State, June 15, 2017. Jeong Yong-soo, “In May, North Offered to End Testing if Washington Backs Off,” JoongAng Ilbo, September 5, 2017. 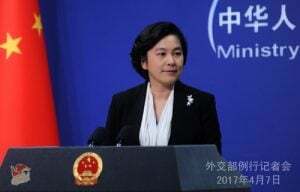 “Foreign Ministry Spokesperson Hua Chunying’s Regular Press Conference on August 30, 2017,” (China) Ministry of Foreign Affairs, August 30, 2017. Featured image is from David Stanley | CC BY 2.0.